Too Much Magic is the insider story of how venture capitalists, media moguls and marketeers use digital "magic" to distract us, invade our privacy, corrupt democracy, distort our human values, and sell us things that we don't need. Authored by Silicon Valley marketing-communications guru Jason Benlevi, Too Much Magic looks at all aspects of our emerging digital lifestyle, how it is changing us, and who it is that really benefits. We have a long love/hate relationship with technology. However, the problem is usually not technology itself, but rather the powers that are deciding its course. The conflict is apparent when we witness people standing in line overnight to buy the newest tech gadget, while at the same time every film about the future from Metropolis to Blade Runner to Avatar depicts a dystopia that has been enabled by technology. Originally, the Mac and personal computing revolution were about self-empowerment, and the Internet was a utility for people to share knowledge. Now that revolution is in danger of being turned against us. Too Much Magic explains how the Cult of Tech, a convergence of business, media and academic interests, is infiltrating every aspect of our lives through clever marketing and digital convergence. Too Much Magic examines what being digital really means. The book details historic changes in our entertainment, personal communications, play time, public affairs and social interactions. It also sounds an alarm on stealthy and escalating attacks upon our basic freedoms. Just as “too big to fail” banks became a threat to our economy, “too big to trust” companies are seizing control of information. Benlevi tells readers what the powers-that-be don t want them to know about their increasingly digital lives. Prescriptively, Too Much Magic points out ways we can choose to delightfully disengage from technologies and exactly what we each can do to preserve our humanity, independence and creativity all of which could vanish through deceptive acts of digital magic. 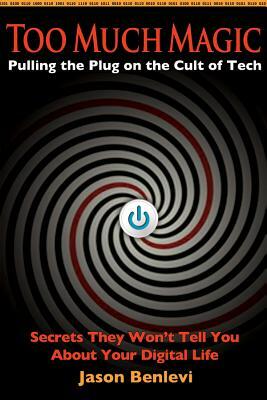 Although the book s topic is serious, its tone is bright and irreverent, offering a refreshing contrarian viewpoint that comes from a deep understanding of technology, media, and culture. Too Much Magic is a unique blend of history, social criticism, and entertainment for the digital age. "Jason Benlevi has written a terrific book. Too Much Magic is a revealing look at the secrets of digital life in a work that all readers can enjoy. I couldn't put it down."